As a Paranormal Investigator, I have participated in several séances (sessions for supposed communication with the dead). My first was an on-air one I arranged in a dimly lit radio studio for a CBC documentary on Houdini. 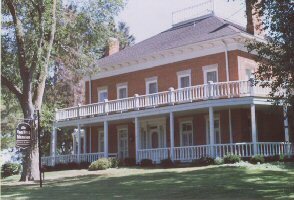 Others included table-tipping séances (once undercover at the "haunted" Van Horn Mansion near Buffalo—see photo), and a "direct voice" (spirit-trumpet) séance at the notorious Camp Chesterfield in Indiana. As well, I have attended many séance-like sessions—either one-on-one with a "medium," or as a member of an audience participating in mediumistic readings—and I have also been a Séance Conductor.